During 2018, the market experienced a favorable upward trend of rising interest rates which generally increased US defined benefit plan funding ratios. As interest rates climbed, plan liabilities dropped which led to a reduction in annuity purchase costs*. 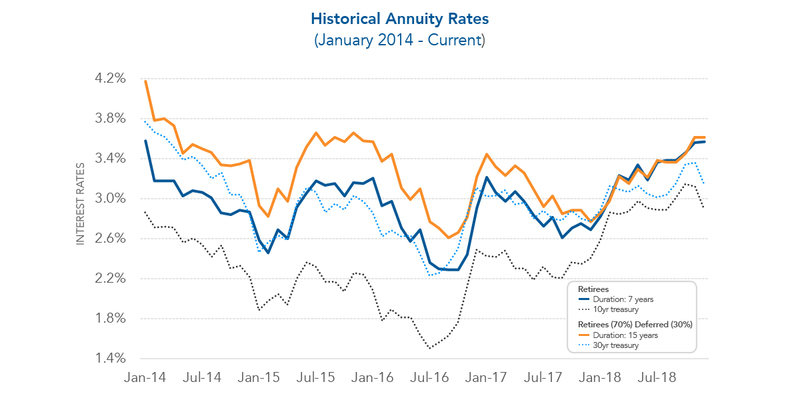 However, as interest rates began to drop in January 2019, annuity purchase costs began to increase along with plan liabilities. 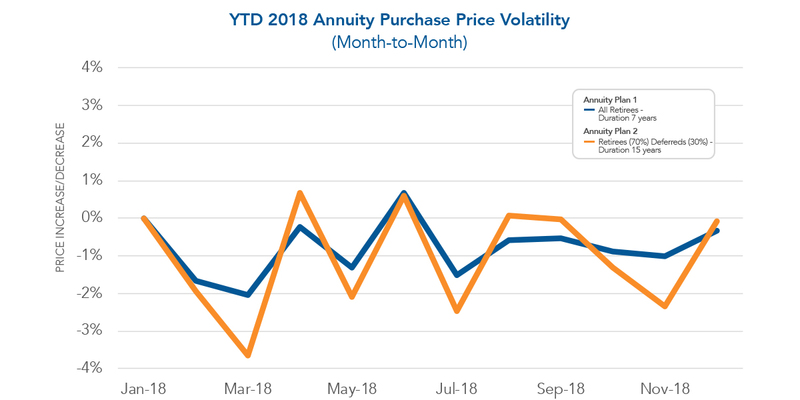 Although overall annuity purchase pricing trended downward during 2018, significant cost volatility persisted month-to-month. The consistent short-term volatility of annuity pricing makes timing an early entrance to the insurance market a crucial part of the planning stage. By connecting with an annuity search firm early, sponsors can take advantage of favorable fluctuations in a volatile market. Have a pension risk transfer need but not sure where to start? See our article, What to look for when comparing Annuity Search Firms. *October Three collects annuity purchase rates for Duration 7 years and Duration 15 years from several insurers on a monthly basis. We have constructed 2 hypothetical annuity plans. Annuity Plan 1 contains retirees only and has a liability duration of 7 years. Annuity Plan 2 contains 70% retirees and 30% deferreds and has a liability duration of 15 years. Using the collected annuity purchase rates and 2 hypothetical annuity plans, we have produced the following graphs representative of actual 2018 Pension Risk Transfer market activity and the corresponding impact on pension plans.